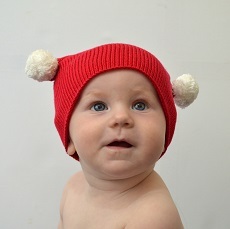 This fun and festive bobble hat for babies and children is knitted in rich red with a cream pom pom attached at both corners. Perfect as a Christmas gift or for keeping little ones warm in the lead up to the festive season. All Smitten baby and children’s hats are knitted in ‘Baby Bamboo’ yarn (80% bamboo 20% wool) developed especially for babies by UK based yarn spinner, Sirdar. The wool content adds warmth to the yarn whilst the eco friendly bamboo fibres give it a super soft and gentle handle. Perfect for snuggling against babies’ skin. Can be machine washed on a wool cycle up to 40 degrees. Please don’t tumble dry.